Rain Fresh® has received many awards, certifications and media acknowledgments over the years. We have listed some of them here. 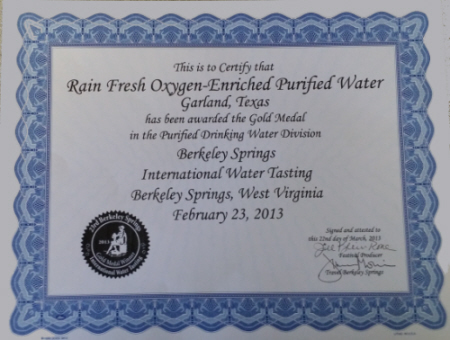 The annual award-winning Berkeley Springs International Water Tasting competition in West Virginia is held in February. For the past 24 years they have bestowed the coveted honor of the best tasting water in multiple categories. It is the largest water tasting competition in the world and is host to over 100 water companies around the globe. 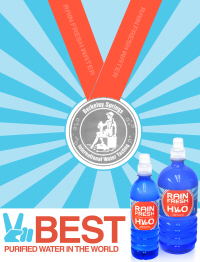 Rain Fresh Bottled Water Company won first place in 2013 in the purified water division. We also won second place in 2011, third place in 2012, and fourth place in 2014. Rain Fresh® Water Company has received the distinguished Food Service Excellence Award from the Garland Health Department for several years. It states, "This ... Award is given only to those food service establishments scoring in the top 5% of their food service class. This is an achievement that is difficult to attain, and one in which the owners and employees of an establishment should be proud." Please click on the small image to view the PDF copy of the award. In October 2010, Rain Fresh acquired certification as a Historically Underutilized Business for the State of Texas, also known as HUB. This certification is designed to facilitate the participation of minority and woman-owned businesses in State of Texas agency procurement opportunities. Please click on the image to see the PDF document of the certificate. We were voted "Best Of Big D" in the August 2007 issue of D Magazine. This little family-run bottled water company has been in business since 1985. Their wet stuff is carbon-filtered, ozonated, reverse-osmosed, and run through a magnetic field to remove "negative memories" of pollutants. It's the best-selling bottled water at area Whole Foods. ....Garland. 972-271-2060. www.rainfreshwater.com.